Cynthia Zaitzevsky. 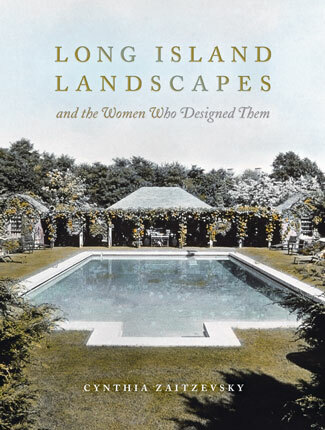 Long Island Landscapes and the Women Who Designed Them. Society for the Preservation of Long Island Antiquities with W.W. Norton & Company, New York & London, 2009. 304 Pp. Black-and-white photographs, plans, 14 pages of color plates, appendix of project lists. ISBN: 0393731243. $75.00. For half a century, between 1890 and 1940, Long Island was to the United States what France had been to Europe in the late 16th and 17th centuries: the style center where an extraordinary accumulation of power and wealth fostered a competitive demand for display that brought artists and artisans to service that demand. If Long Island, during what is now called the Country Place or Great Estates Era, was a playground for the rich, it was also a nursery for landscape architects and their skilled support teams of nurserymen and installers. The makers of Versailles and other French palace and château ensembles (working originally from Italian inspirations) produced a language of spatial control that dominated Europe; the landscape architects of Long Island, working to a great extent from those European models, developed design and horticultural “languages” used in wealthy American suburbs nationwide. In both periods, landscape design proclaimed a new political and economic ascendancy, as well as the rise of a dominant, confident nation. The Long Island estate assemblage also spoke to women’s rise in the profession. That half of the 150 privately owned designed landscapes identified by 1997 were created by female practitioners was the astonishing finding made when Long Island Country Houses and Their Architects, 1860-1940 was published (Robert B. Mackay, Anthony K. Baker, and Carol A. Trainor, eds., Society for the Preservation of Long Island Antiquities in association with W.W. Norton & Company). Now, in a follow up volume, Cynthia Zaitzevsky, a historian of architecture and landscape architecture, has located eighteen women landscape architects, many of national stature, working on Long Island. She follows their lives as well as their careers. In dignified, nonpolemical prose, Zaitzevsky describes the difficulties all encountered because of their gender in obtaining training or in setting up their practices. She identifies biographical factors that probably made success easier to achieve such as the presence of a mentor (often male), the need for income, and the absence of children or marriage partners in a number of cases. She offers an overview of the professional institutions and programs that admitted women over the decades, most of them, initially, in New England, and gives due credit to garden clubs, especially member clubs of the Garden Club of America, as incubators of talent. Six major figures receive a chapter apiece. Perhaps because of the scope of their work, and the continued existence of important works open to the public outside of Long Island, as well as coverage in previous publications, chapters on Beatrix Farrand (Dumbarton Oaks, Washington, DC), Marian Coffin (Winterthur, DE), and Ellen Shipman (Longue Vue, New Orleans, LA) come as no surprise. Martha Hutcheson, Ruth Dean, and Annette Flanders are comparatively unknown outside the field of landscape and garden history; Zaitzevsky makes the case for their inclusion. Two chapters on the second generation chart the progress twelve women landscape architects made in the public sphere after educational and employment opportunities with established firms came more easily. They designed parks, fairgrounds, campuses, housing projects, and parkway plantings as well as residential landscapes. The scope of these later chapters extends well beyond the Country Place Era: Alice Recknagel Ireys, who died in 2000, designed a cutting garden at the Brooklyn Botanical Garden in 1988. Many of the gardens featured in Zaitzevsky’s book are, or at least appear to be, similar: designed forms are constantly caught at the same angles by gifted photographers such as Mattie Edwards Hewitt who learned to interpret vista, enfilade, wooded walk, gazing pool, arbor, pergola, and parterre chiefly for magazine consumption. As in Byzantine art, figure/ground relationships are repeated, and shifted or manipulated only slightly from place to place. Since many landscapes have been destroyed, it’s impossible to say how they differed in actual experience. Style runs from Beaux Arts to Modernism, size from less than an enclosed half acre to huge viewsheds with prized vistas of ocean and bay. Great Estate Long Island, where many of Zaitzevsky’s women founded their practices, has long been the province of myth, folktale, and pure spin. This elegant, beautifully designed and printed book does not chronicle the extravagance of clients, nor their playland antics. Instead, the level of detail and wealth of new material offered about each practitioner is staggering, and scrupulously presented. An invaluable appendix lists both projects and archives. Long Island Landscapes is that impossibility: a completely reliable scholarly reference and a superb read. Thaisa Way’s thoughtful new book, Unbounded Practice: Women and Landscape Architecture in the Early Twentieth Century (Charlottesville & London: University of Virginia Press, 2009) extends the horizon of enquiry to the nation; Way also examines specifically how modernism, and the increasing professionalization of the field eventually blocked the connection between gardening and architecture per se that had been the entry point for most of the first generation of practitioners.